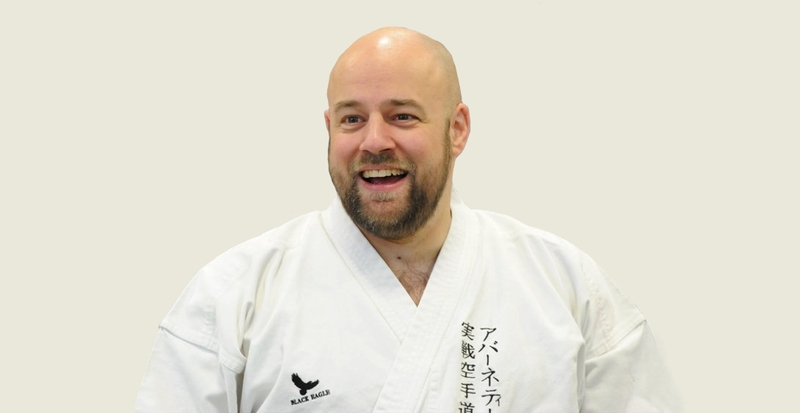 In The Basics of Bunkai Part 5 we’ll be looking at two applications of the “lower-block”. 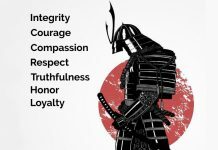 As we established in the first part of this series, the modern labels attached to many kata techniques have nothing to do with their intended function. These labels arose relatively recently in karate’s development and originate from the “watered down” karate taught to Okinawan school children in the early 1900s. Prior to this time, karate was not openly taught and both the kata and their application were closely guarded secrets. So there was no uniform terminology prior to the terms used by the school children. So if “lower-block” was never meant to be applied as a block, then what is it? 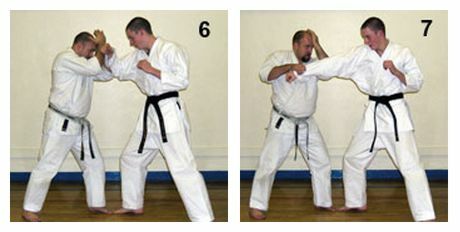 “Lower-block” has lots of different functions and which one is being illustrated at any given point depends upon the kata in question and the surrounding movements. As we discussed in Part 4, prior to the standardisation of kata not all “lower-blocks” would be performed in exactly the same way. The motion would be slightly different depending upon what function was being illustrated. 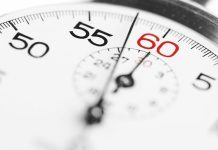 From the number of “lower-blocks” in kata we can determine that the motion must have many functions, otherwise it wouldn’t be shown so many times. In this article, we’ll look at using the “lower-block” as a combination takedown and an arm-lock. There are of course many other applications for “lower-block”, but the two I’ve selected should also help us to further our understanding of the key concepts of bunkai. Cover and gain control of the opponent’s lead arm (Figure 1). Secure a grip on the opponent’s arm. Pull their arm towards you and down. This pull will turn the opponent’s head slightly and ensure your elbow has a clear run in to the base of the opponent’s skull. This is the function of the “preparation” of the “lower-block” (Figure 2). If the elbow has landed strongly, but the opponent is still in the fight, the remainder of the “lower-block” motion can be used to crank the opponent’s neck and take them off balance. Maintain your grip on the opponent’s arm (the function of the hikite) as your forearm pushes against their jaw in a circular motion in order to crank their neck and break their posture (Figure 3). Complete the “lower-block” to take the opponent completely off balance and onto your knee (Figure 4). If needed, you can then follow up with any suitable strike (Figure 5). The fact that your partner’s spine or kidneys will hit your knee as they fall means that great care needs to be taken when practising this technique. You must also ensure that you are always being supervised by a suitably qualified and experienced person during bunkai training. 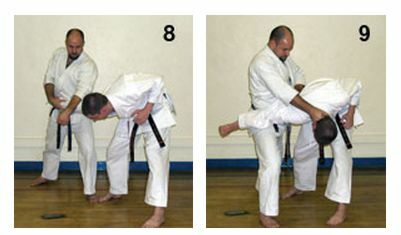 In this technique we can see some of the principles of bunkai that we have introduced in previous articles. We can see how the full movement is used, how both hands are being used, how the stance serves a practical purpose, etc. One other fundamental bunkai concepts illustrated by this movement is that every single kata movement should, at the very least, leave the opponent in a position where they are extremely vulnerable. It is quite common for kata movements to be incorrectly interpreted so that no advantage is gained and the karateka is left in a “neutral” position. You’ll notice how this motion has trapped the opponent’s arm, struck them, cranked their neck, dropped their spine on to your knee, and left them in a position where they are extremely disadvantaged. There are innumerable historical, technical and practical reasons why the motion should not be applied as a block. One of these reasons is that when this movement is used as a block (taking as read that it’s very unlikely to work, but for the purposes of discussion let’s say that it does) you’ve done nothing to disadvantage the opponent. This is in breach of one of the fundamental principles of bunkai study: It should always be remembered that every single kata motion must, as an absolute minimum, disadvantage the opponent and leave the karateka is a position of significant advantage. The second application for lower-block that we’ll be looking at is an arm-lock performed at an angle. Before we look at the technique itself, we need to examine what the angles in the kata are actually meant to represent. It’s at this point that we need to dispel the common misunderstanding that the angles in kata represent you turning to face a new opponent. You are never changing angles to face a new opponent! In the vast majority of situations the opponent will be in front of you. The main exception being when your awareness wasn’t what it should have been and the opponent has got the drop on you. In those instances you’ll probably be out of the fight before you know you’re even in it. So what are the angles representing if not moving to face new opponents? When a movement is performed at a new angle, the kata is telling you to position yourself at that angle in relation to the opponent. 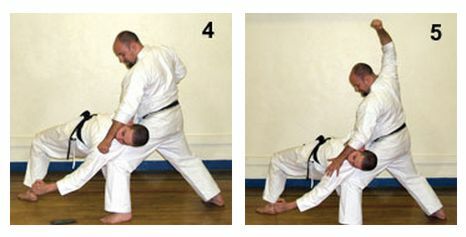 Being at the angle demonstrated by the kata will increase the effectiveness of the technique in question. This is a very important key to understanding kata. The opponent is almost always in front of you and the angle tells you how you need to be positioned when applying the technique. If a move is performed at forty-five degrees, it means you must move to a forty-five degree angle to your opponent when applying that technique. Because a kata motion will be linked to a preceding technique – which it may not be linked to in application – the movement of the kata to get to the designated angle is often not the same movement of the feet used in application. When analysing kata, it is the angle that is important, not the step in the kata used to get there. Remember, the step in the kata may simply be linking two unrelated techniques. To illustrate the principle of angles let’s look at the “lower-block” after the last “rising-head-block” in Pinan Nidan / Heian Shodan. As we’ve already mentioned, the application of this movement is an arm lock performed at an angle. Your arms have clashed with the opponent’s arm (Figure 6). Seize the opponent’s wrist and position your forearm just above their elbow (Figure 7). Pull the opponent’s hand to your waist as you rotate their forearm. Keep your forearm in contact with the opponent’s arm and push down and around in an arcing fashion. As you rotate the opponent’s forearm, the position of their elbow will also rotate. It is for this reason that your pushing arm must move in an arc in order to keep applying pressure to the correct point. This rotation of the arm makes it very difficult for the opponent to resist the lock due to the constantly changing direction of the force. Step around with your back foot in order to add bodyweight to the technique and to increase your mechanical advantage. This is the application of the “lower-block” (Figure 8). In Wado-Ryu and Shito-Ryu the technique is normally performed at a forty-five degree angle. In Shotokan it is performed at a ninety degree angle. Both work. Now that the opponent is off balance and their head has dropped down, you should seize the opponent’s shoulder and apply a downward pressure. This will ensure that you maintain control over the opponent and it will prevent them from regaining an upright position. Step forwards and deliver a strike to the base of the opponent’s skull (Figure 9). Notice how moving to the forty-five or ninety degree angle demonstrated by the kata takes you away from the opponent’s free hand and significantly increases the effect of the arm lock by increasing your mechanical advantage. In this article, we’ve looked a couple of applications for “lower-block” and briefly looked at a couple more bunkai principles. Those who have been following these articles from the beginning will now be starting to grasp the basics of bunkai. As we said at the very beginning, understanding kata and taking part in bunkai training is something that everyone can do. It’s not the sole reserve of the highly graded or those who posses the “secrets”. 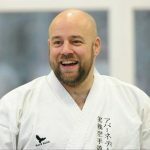 To understand bunkai, all you need to know are the kata and the principles and concepts we’ve been covering in this series. In Part 6 we’ll look at some specific bunkai examples from the Pinan / Heian series and begin to recap what we have leant so far. 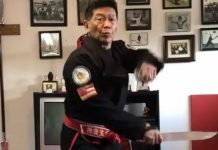 Kata Naihanchi – Karate’s Most Deadly Kata?